Use Chicago as your inspiration for your first glass fusing project! 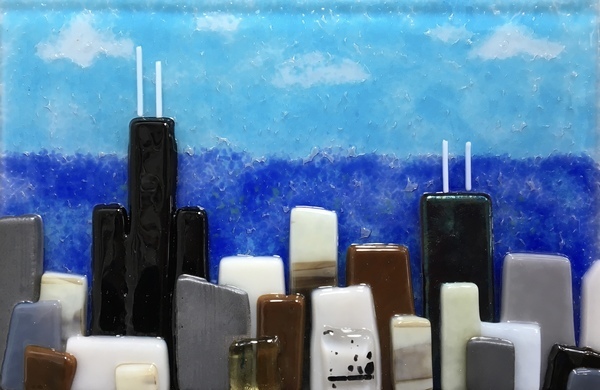 Chicago's skyline, beaches, architecture, river, flag, bridges and neighborhoods are easily translated into fused glass shapes, colors and textures. You will use a variety of colored glass pieces to create a colorful one-of-a-kind glass piece. Bring a beverage of your choice and snack to enjoy while creating your glass cityscape. Create a wall hanging or dish. You will learn the basics of cutting and assembling flat glass. Pre-cut pieces will also be available to make your 6" x 4" or 5" x 5" piece.